BROOKS, Alta. 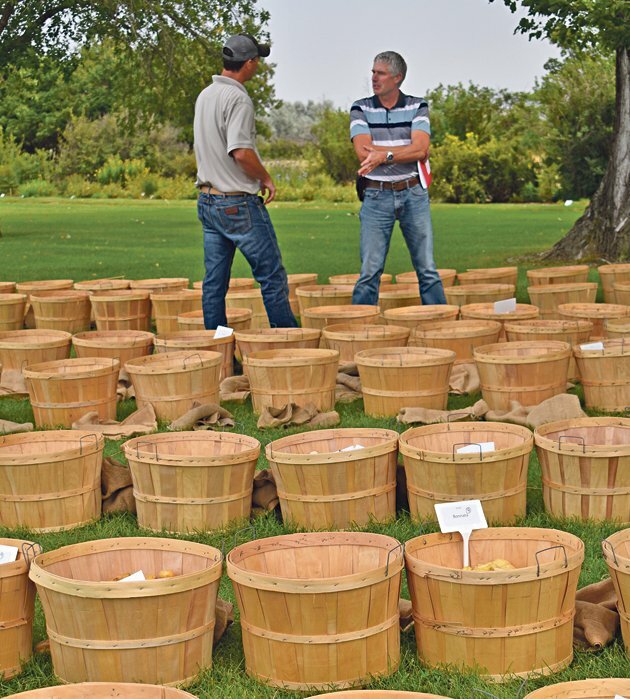 — More than 100 separate bushel baskets of potatoes, each containing the production from 10 hills, are lined up on the grass at the Crop Diversification Centre South. Each contains a different variety of potatoes, some of them tried and true and others being considered for multiplication and future production. “Breeding is a long-term process which takes about 10 to 12 years to get to the market,” said Benoit Bizimungu, chief potato breeder with Agriculture Canada. There is a lot to consider when breeding potatoes because end use has major implications. Is the variety destined for the fresh table potato market? Are there consumer trends in terms of shape or colour? Will the potatoes become french fries or potato chips? Will they need to be stored for long periods and if so, will they store well? Does the variety produce tubers of the right shape and texture for the designated end use? Where in Canada will it grow best? Bizimungu said Agriculture Canada addresses the latter question by having seven test sites across the country. “In every major production area, we have a trial site to see which ones have local adaptation,” he said. Bizimungu said the potatoes on display at this field day are essentially an adaptation trial showing varieties selected at the research stage. The next step is to see how they adapt to different environments. “It’s the selection process after that, that makes the difference,” said Alberta Agriculture potato research specialist Michele Konschuh. Varieties with promise are grown in trials, and a short list is then offered to industry for evaluation. After a few years of testing, there is a sealed bid process in which companies can bid exclusively or non-exclusively for the North American or global rights. Successful bidders can then take the variety forward, build a seed supply and start commercial production. “It’s really a dance to try to get good material out there for them to evaluate and then to ensure that the people who have decision making capabilities to select those varieties and move them forward, we just try to pair them up. It’s like speed dating,” said Konschuh. Ed Vandenberg, chair of Potato Growers of Alberta, said research is vital to the industry’s health. “We’d always like to see more but we’re definitely very supportive of the work that is done here and it’s very important to us that we are progressive in finding new varieties … for disease issues and better use of nitrogen, more efficient use of water. Alberta’s potato industry is worth about $1 billion annually, even though the province is more widely known for its beef than its spuds. “We consider ourselves the side dish for beef,” said Konschuh. Potato harvest in Alberta is well underway. Vandenberg said harvest for potato chip varieties began in early to mid-August and harvest of french fry and storage potatoes was due to begin around Sept. 10. “Mostly I think it looks promising, under the irrigation, as long as people could keep the pivots running,” he said.